One of the comments below a youtube video showing water buffalo (Syncerus caffer) defending a calf from lion predation expressed ridicule toward the big cats for being chased away by “a bunch of cows.” The word, cow, used as a verb, descends from the Old Norse word, Kuga, meaning to oppress, intimidate, or easily herd; and the word, coward, originates from the Latin word, cauda, meaning tail or tail between the legs. The origins of the 2 words might be interrelated, though the noun form of cow is likely a verbalization of the lowing sound cows make. Modern cows were bred to be cowed, as in easily herded. However, the ancestor of the cow, the aurochs, (Bos primigenius), was anything but easily herded. They were larger and fiercer than modern cattle and readily attacked man on sight. Nevertheless, they became extinct. The last known aurochs was killed in Poland during 1627. For propaganda reasons the Nazis bred primitive cattle in an attempt to bring the aurochs back, creating a breed known as the Heck. Although the Heck never reached the size of the aurochs, some individuals are so aggressive that modern farmers find them impossible to raise. Wild cattle are dangerous, and a more informed person would not ridicule lions trying not to get trampled and gored. Prehistoric cave painting of an aurochs, the much larger and more aggressive ancestor of modern cattle. Amazingly, humans somehow began to tame and breed the aurochs, probably about 8,000 years ago. The early herdsmen selected individuals for smaller size, reduced aggression, easier herding, and better disease resistance. Genetic evidence from a 6700 year old cow bone found in Derbyshire, England suggests the early domesticated cattle occasionally back bred with the aurochs. Domestication of the aurochs took place in 2 different geographical regions. Aurochs, tamed and bred in eastern Europe, are the ancestors of Bos taurus, and the Indian aurochs was bred into Bos indica. 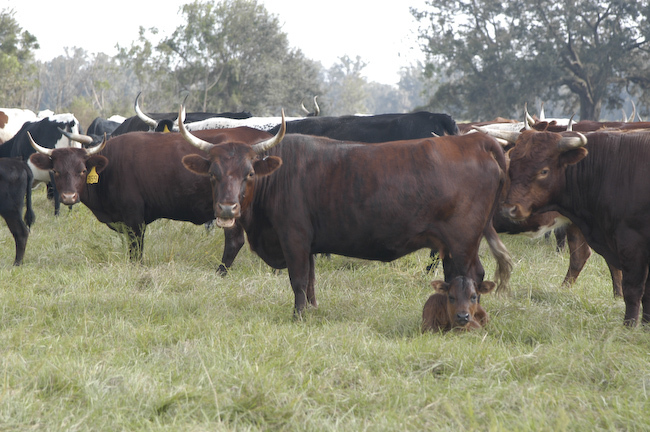 Florida cracker cattle descend from cows brought to North America by the Spanish in the 1500s. Bos indica. They descend from a geographically separate population of aurochs than Bos taurus. 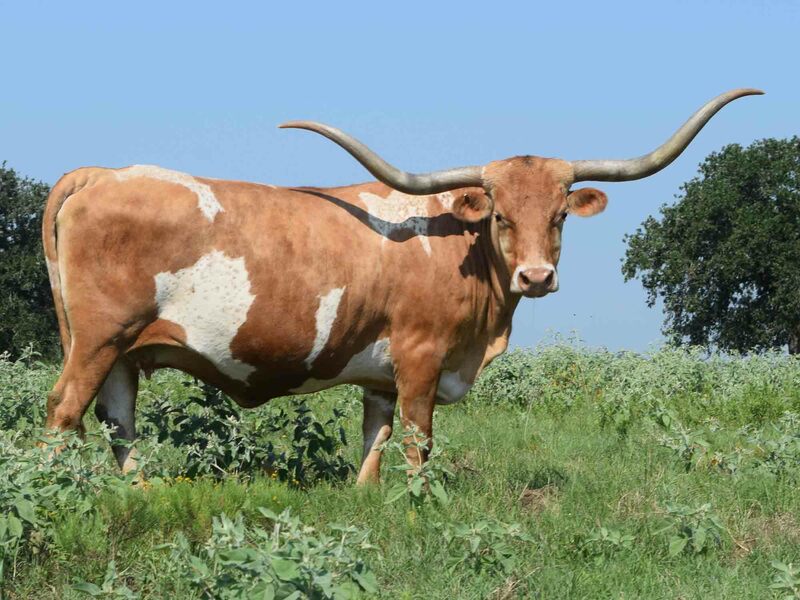 Texas longhorn cattle are Bos taurus x Bos indica hybrids. Wild longhorns are tough animals capable of fighting off wolves, bears, and cougars. Hundreds of thousands ranged Texas and Mexico from ~1700-~1900. Early Spanish explorers and settlers brought cattle to North America during the 16th century. They were let loose in the woods and fields to forage, and soon there were large herds of feral cattle wandering southeastern North America. Wayne Van Horne critically reviewed all of the early accounts of bison in the region, and he determined most of these were probably referring to feral cattle rather than bison. European colonists used the term, buffalo, interchangeably for either wild cattle or bison. Most had never seen a bison, and there were no field guides that could’ve aided a correct identification. Van Horne thinks the “buffalo” General Oglethorpe, the man who founded Georgia, hunted in 1746 were actually feral cattle. The Great Buffalo Lick, located in central Georgia, may be misnamed because feral cattle were licking the soil there, not bison. William Bartram saw great mixed herds of feral cattle, horses, and deer but never saw a buffalo when he traveled through the south from 1773-1776. He did see bones of buffalo, but these could’ve been the bones of wild cattle. However, Van Horne does note 3 credible accounts of bison in the deep south. Mark Catesby correctly described bison ranging near Fort Moore along the border of central Georgia and South Carolina. John Lawson reliably reported bison migrating through a mountain pass to the Cape Fear River in North Carolina. And some early Spanish explorers saw bison feeding in abandoned Indian fields located on the panhandle of Florida. The historical evidence suggests bison were very rare in the post-Pleistocene deep south, but the population of feral cattle here exploded during European colonization. By the Civil War the cattle population of Florida was 700,000 vs. 140,000 people, and most of these herds were feral. The longleaf pine savannahs that supported large herds of wild cattle in the deep south were also excellent habitat for sandhill cranes, Canadian geese, and turkeys. Cattle grazing improves habitat for burrowing owls and caracaras. Payne’s Prairie in central Florida is a remnant of habitat where bison, Florida cracker cattle, and a rich diversity of birdlife can still be found. Some day, I hope to visit Payne’s Praire, but I can’t get other family members interested in it as a vacation destination. Scientists analyze the bone chemistry of extinct species to determine what they ate. This is known as “stable isotope analysis.” Some scientists even claim it’s possible to determine which carnivores outcompeted other large predators based on their stable isotope analysis. (See: https://markgelbart.wordpress.com/2015/05/02/surprising-discoveries-of-large-carnivore-dietary-preferences-on-the-pleistocene-mammoth-steppe/ ) I was always skeptical of the broad sweeping claims of these studies because the sample sizes were too small, they rely on too many assumptions, and they use too much dodgy math. But I never voiced my skepticism. I thought what do I know? The authors of these studies are brilliant scientists, and I am just a lay-shmuck. However, a new study vindicates my skepticism. Oddly enough, this study was published in the comments section of Quaternary Science Reviews , rather than as a regular article, even though it is a scientific study and not an opinion piece. The authors of this study examined the coprolites and gizzard contents of 3 different species of extinct moas that formerly ranged throughout New Zealand. The moa coprolites were associated with the subfossil bones of the birds, so this gave scientists an opportunity to test the accuracy of stable isotope analysis. They discovered the assumptions they make based on stable isotope analysis are not at all reliable. Skeleton of the heavy-footed moa. The environment of New Zealand before man arrived on the islands consisted of southern beech forest mixed with grassland. The coprolites of the heavy-footed moa (Pachyornis elephantopus) show that if fed in the open grasslands. The little brush moa (Anamalopteryx didiformis) ate plants the grow in the forest understory, and the giant moa (Dinornis robustus) was a generalist feeder that ate plants of the woods and grasslands. The stable isotope analysis of the moa bones suggested the opposite–that the little brush and giant moas fed in more open environments than the heavy-footed moa. The direct evidence shows stable isotope analysis is little more than wild guessing. There is only 1 way to know for sure what extinct animals ate…the contents of their feces. Mastodon dung excavated from the Aucilla River, Florida. We know exactly what mastodons ate in Florida by identifying the contents of their feces. Sea level rise following the end of the most recent Ice Age reduced the land area of the Caribbean Islands. (See: https://markgelbart.wordpress.com/2011/11/11/banana-hole-fossil-sites/ ) The Bahamas, now consisting of numerous small islands, was formerly 1 big island. During the Pleistocene the Caribbean Islands hosted an interesting, if depauperate, mammalian fauna including dwarf ground sloths, monkeys, rodents, insectivores, and bats. The extinctions of dwarf ground sloths on Caribbean Islands occurred well after the extinctions of mainland ground sloths, and the timing is associated with the colonization of the islands by people. However, a recent study of bat extinctions and extirpations on Caribbean Islands suggested they were caused by rising sea levels that flooded cave roosts and reduced the area of suitable bat habitat. But there was a big flaw in this study–the authors didn’t use radiocarbon dating of subfossil bat material. A newer study remedied this flaw and determined Caribbean bat extirpations occurred thousands of years after sea level rose near present day levels. The authors of this study focused on specimens of the 9 species of bats found in Ralph’s Cave on Abaco, the northernmost island of the Bahamas. Location of Abaco, northernmost island of the Bahamas. There are partially flooded caves underneath the surface of this island that serve as bat roosts. Ralph’s Cave. Bats roost in the parts that are above water. Of the 97 bat bones found in Ralph’s Cave, 51 of the specimens belong to species that still roost in the cavern, parts of which are still above water. The extant species include the big brown bat (Eptesicus fucus), Bahamian funnel-eared bat (Chilonotulus tinisterferons), buffy flower bat (Erophylla segherum), and Waterhouse’s leaf-nosed bat (Macrotus waterhousii). 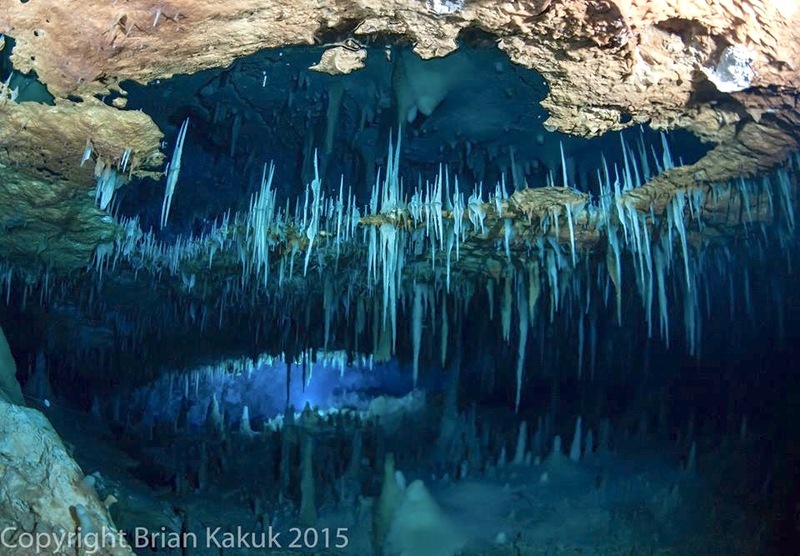 The bones of 5 species of bats that no longer inhabit Abaco were excavated from the cave as well. These include specimens of the Greater Antillean long-tongued bat (Monophyllus redmani), Parnell’s mustache bat (Pteronotus parnelli), Cuban greater funnel-eared bat (Natalus primos), minor red bat (Lasiurus minor), and the southeastern myotis (Myotis austroriparius). Radiocarbon dates of the minor red bat, Cuban greater funnel-eared bat, and Parnell’s mustache bat show these 3 species lived on Abaco as recently as 3600 BP. 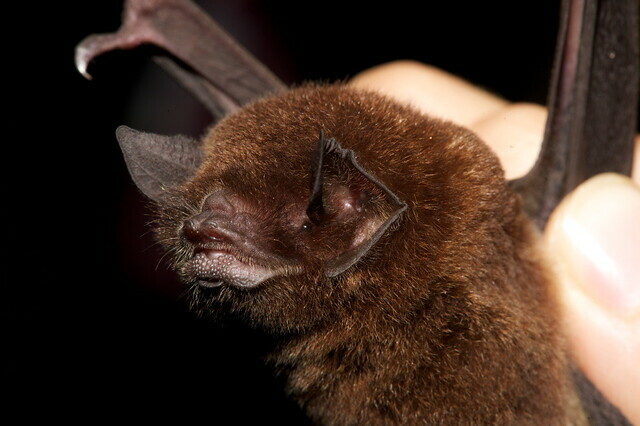 The southeastern myotis, a widespread bat in southeastern North America, still inhabited Abaco 4000 years ago, and the Greater Antillean long-tongued bat occurred on the island until 1700 BP. Radiocarbon dating of additional specimens of these locally extirpated bats may show they lived on Abaco even more recently. 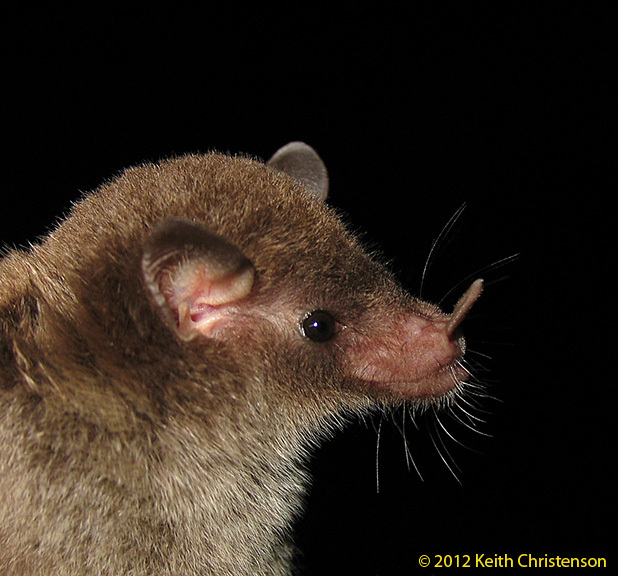 The Greater Antillan Long-tongued bat eats nectar, fruit, and insects. They’ve been extirpated from Abaco. Parnell’s mustache bat. Also extirpated from Abaco. The Cuban greater funnel-eared bat is extirpated from the Bahamas and is in danger of extinction in its last stronghold–Cuba. The 1 cave where it still roosts recently collapsed. The authors of this study also calculated the amount of suitable bat habitat on Abaco, and they determined “the minimum amount of bat habitat to sustain viable bat populations (of the extirpated species) was unchanged” following the transition from the Pleistocene to the Holocene. 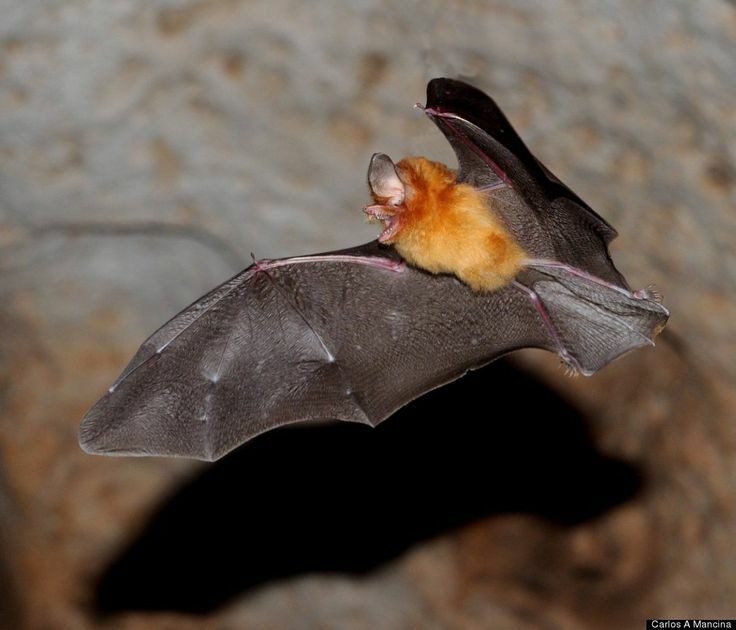 Bat habitat shrank but not enough to cause these species to disappear. The authors of this paper stated “the precise mechanism (of extirpation) is undetermined.” They suggest human activities may have played a role. Humans setting fires, clearing forests, or directly gathering the bats could have been detrimental to the extirpated species. I don’t think humans preyed on these bats because they are too small. Humans do eat flying foxes in Asia, but these fruit-eating bats are sizable and have substantial meat on their bones. If humans are responsible for the extirpation of some bat species on Abaco, it must be through some form of habitat alteration. Viruses in the lyssavirus genus cause rabies, still a feared disease in many Third World countries. Rabies kills over 24,000 people every year in less developed countries, but the annual death toll in the U.S. since 1900 has dropped from about 100 to 1 or 2. Rabies viruses evolved characteristics that force physical reactions in infected organisms, and these reactions help facilitate the spread of the virus into the environment. The rabies virus attacks the central nervous system of a vertebrate. Eventually, the infection causes an inflammation of the brain. Symptoms include insomnia, the inability to swallow, and a paralysis that inevitably leads to death. An infected animal, unable to swallow, still produces saliva, and this spit foams at the mouth. The saliva is loaded with the virus. The insomnia causes great confusion and irritability, especially among carnivores that require lots of sleep. (For example cats sleep 20 hours a day.) This explains why animals infected with rabies behave oddly and more readily bite. They become unknowing slaves to the virus, passing it in their infected saliva when they bite because they are behaving irrationally. Studies of vampire bats determined rabies spreads in waves. Some individual bats, unlike humans, are immune to the virus, and the population of immune individuals increases. Rabies will disappear from the population for awhile but will return after a few generations when enough non-immune individuals are born. Rabies viruses belong to the lyssavirus genus. YouTube video of a raccoon infected with a rabies. The virus attacks the brain in a way that makes the victim unable to swallow. The virus then spreads in the foaming saliva on the mouth and is transmitted via a bite into the blood stream of another organism. If you see an animal like this, shoot it, or call somebody else to come shoot it. Louis Pasteur and Emile Roux invented the first rabies vaccine in 1885, and it has since been improved upon. The widespread vaccination of pets accounts for the decline in human rabies in the U.S. The vaccine can save people after they have been bitten by a rabid animal as well. Modern treatment consists of thoroughly washing the wound with soap (this alone can kill the virus), followed by 5 injections in the shoulder with the vaccine. Doctors no longer administer rabies shots deep into the stomach muscle. Vaccinations only work if given before brain inflammation occurs. Formerly, the mortality rate from rabies-caused brain inflammation was 100%. But in 2004 Rodney Willoughby invented the Milwaukee Protocol. His patient, Jeanna Giese, was suffering encephalitis after being bitten by a bat a month earlier. (The girl and her mother didn’t realize the bite required urgent treatment.) Dr. Willoughby hypothesized the rabies virus killed humans before the person’s own immune system had a chance to produce enough anti-bodies. So he put Jeanna in a medically-induced coma using anesthetics and barbituates, and he also prescribed anti-viral medication. Meanwhile, she was kept on a respirator. After a week her body had become immune to the disease, and she survived, though she suffered some brain damage, and it took her months to learn how to walk again. Since this case, the Milwaukee Protocol, named after the location of the hospital where it was first tried, has been used 41 times but has just an 8% survival rate, and the survivors have varying degrees of brain damage. Do not delay treatment, if bitten by a wild animal. Jeanna Giese is the first person to ever survive rabies after the disease had progressed to the brain inflammation stage. Rabies is an ancient disease that was certainly widespread during the Pleistocene. Rabies occurs on every continent except Antarctica and may predate the break-up of supercontinents. Scientists don’t know where it originated. Medical historians believe rabies occurred in the Americas before Columbus, along with other diseases such as syphilis, tularemia, giardia, dysentery, hepatitis, herpes, and staph infections. The Spanish encountered rabies early during the conquest of South America. It’s not likely they brought infected animals with them. An animal infected with rabies would show symptoms before the long sea journey was over and would’ve been destroyed on board ship. You are currently browsing the GeorgiaBeforePeople blog archives for June, 2016.